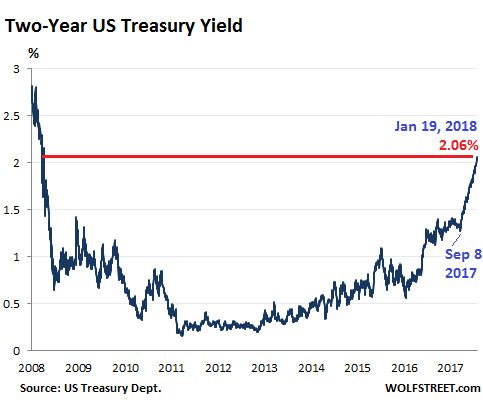 Latest from Wolf Richter: The US government bond market has further soured this week, with Treasuries selling off across the spectrum. When bond prices fall, yields rise. For example, the two-year Treasury yield rose to 2.06% on Friday, the highest since September 2008. In the chart, note the determined spike of 79 basis points since September 8, 2017. That was the month when the Fed announced the highly telegraphed details of its QE Unwind.